On the eve of Philae’s landing, the European Space Agency has released its top ten images of comet 67P/Churyumov–Gerasimenko taken by Rosetta’s navigation camera from its lowest orbit just 10 kilometres from the centre of the nucleus. This image showcases one of the many pits seen on the surface of 67P/Churyumov–Gerasimenko. Pits like these are thought to be where gas vents into space from the porous subsurface, carrying with it dusty grains of comet material. 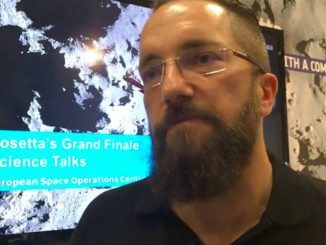 Scientists are keen to learn the role of this pit – and others – in the development of the comet’s activity, as it gets ever closer to the Sun. 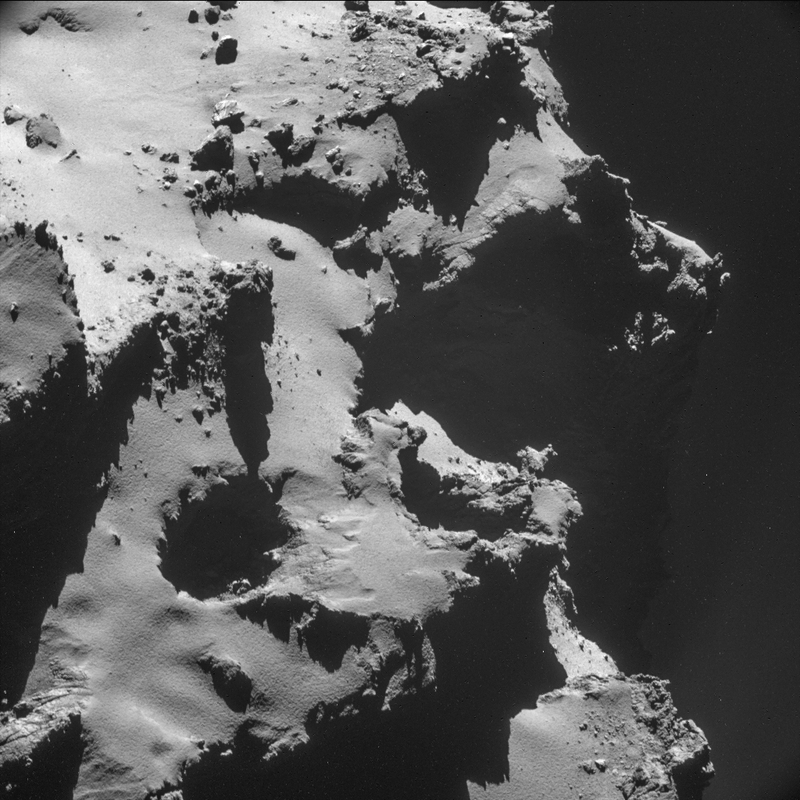 This single-frame NAVCAM image measures 1024 x 1024 pixels. It was captured from a distance of 9.9 km from the centre of the comet (about 7.7 km from the surface) at 02:22 GMT on 15 October 2014. At this distance, the image resolution is 84.6 cm/pixel and the size of the image is 866 x 866 m.
This dramatic view along the horizon highlights several relatively smooth, flat-topped plateaus that stand above the rugged surface on the larger lobe of Comet 67P/Churyumov–Gerasimenko. But their flat tops betray the scars of the walls just below, extensively criss-crossed with fracture-like features. 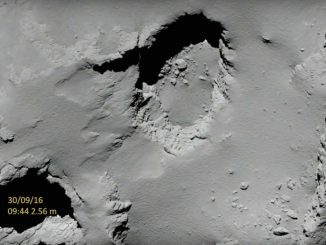 At their bases lies plentiful rubble, perhaps once originating from the cliff faces, having crumbled away under the erosive forces at work on the comet. 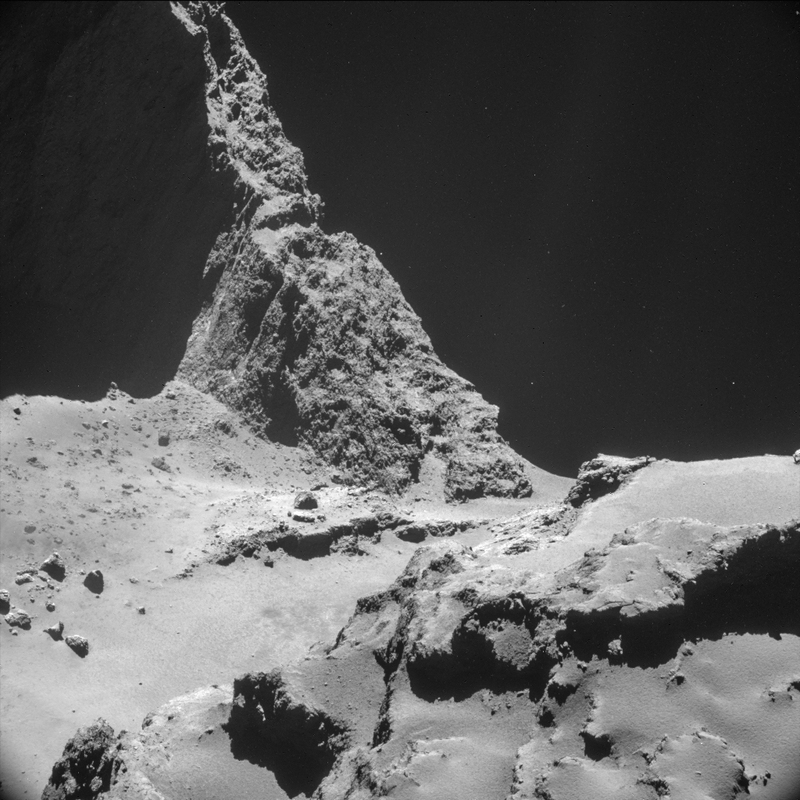 This single-frame NAVCAM image measures 1024 x 1024 pixels. It was captured from a distance of 9.8 km from the centre of the comet (about 7.8 km from the surface) at 06:08 GMT on 21 October 2014. At this distance the image resolution is 83.9 cm/pixel and the size of the image is 859 x 859 m.
This scene features the boulder named Cheops, the largest and brightest boulder towards the top left of the image. It measures about 45 m across and 25 m high. Cheops and the surrounding cluster of boulders reminded scientists of the famous pyramids at Giza near Cairo in Egypt, and so it was named for the largest of those pyramids, the Great Pyramid, which was built as a tomb for the pharaoh Cheops around 2550 BC. Another large boulder lies towards the bottom of this frame and is surrounded by many smaller boulders that seem to be appearing from beneath the smooth, dusty material that dominates this scene. The smooth region extends to the top right of this frame, where rougher terrain appears to be exposed beneath it. 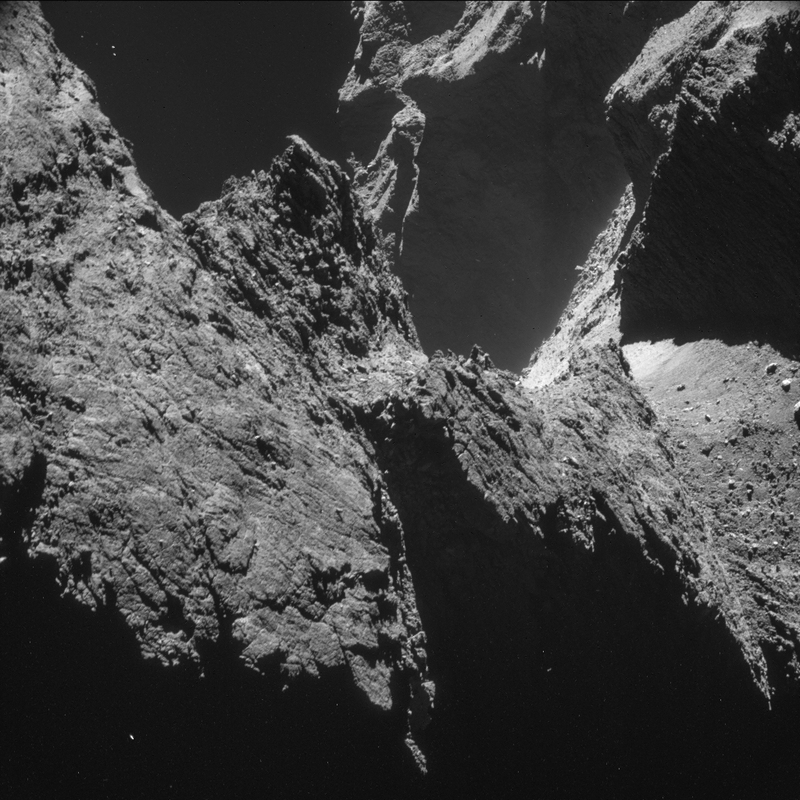 This single-frame NAVCAM image measures 1024 x 1024 pixels. It was captured from a distance of 9.8 km from the centre of Comet 67P/Churyumov–Gerasimenko (about 7.8 km from the surface) at 18:22 GMT on 23 October 2014. 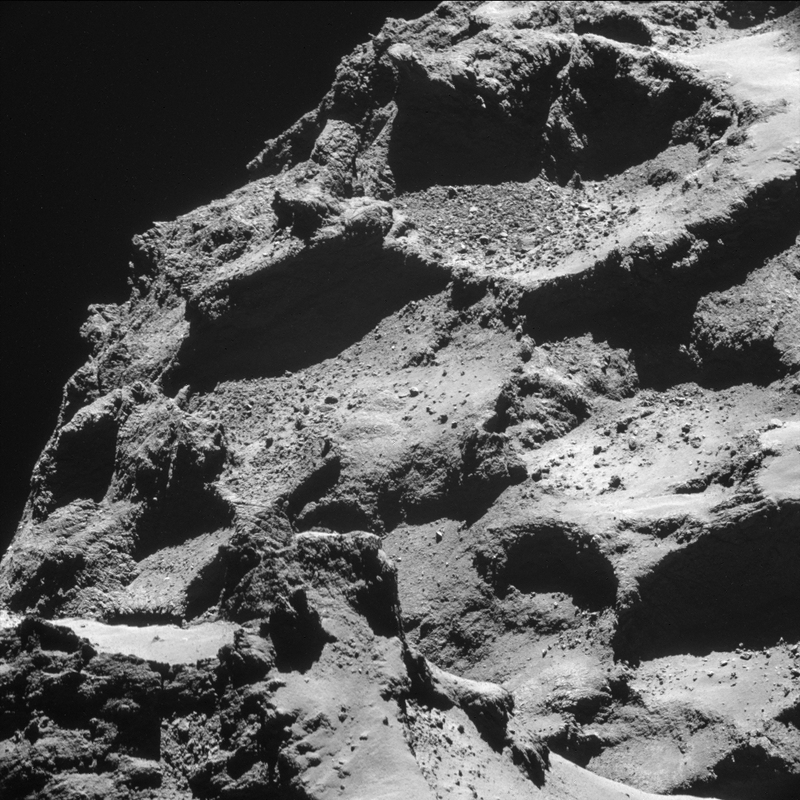 At this distance, the image resolution is 83.4 cm/pixel and the size of the image is 854 x 854 m. This scene is located on the lower side of the larger comet lobe. This unusual view takes a side-on look down the smaller lobe of Comet 67P/Churyumov–Gerasimenko and onto the smoother terrain of the ‘neck’ region. 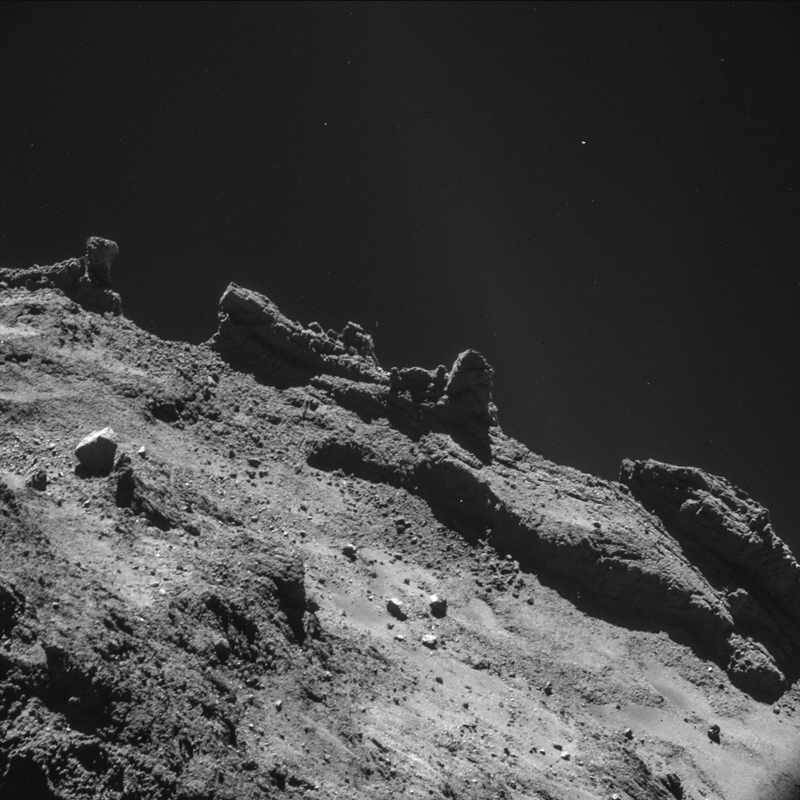 In the background, cliffs of the comet’s large lobe rise from the shadows, adding to the dramatic feel to this image. This single-frame NAVCAM image measures 1024 x 1024 pixels. It was captured from a distance of 9.8 km from the centre of the comet (7.8 km from the surface) at 22:04 GMT on 23 October 2014. At this distance, the image resolution is 83.5 cm/pixel and the size of the image is 855 x 855 m.
In this scene from the large lobe of Comet 67P/Churyumov–Gerasimenko, sets of long, parallel grooves and ridges in the foreground draw the eye up to a block of layered material (appearing as vertically stacked layers in this orientation) in the centre of the frame. This ridge traces up to a peak in the distance, through a cascade of boulders. To the left, flat-topped steps contrast against a ‘pinnacle’ seen against the horizon. To the right, a patch of brighter material lies crumbled at the base of a steep wall – perhaps signalling material that has been freshly exposed. In a different orientation, seen in image 6, the ‘peak’ actually appears as a flat ridge that slopes down onto a flat plateau, showing the importance of viewing features from different angles in order to understand them fully. This single-frame NAVCAM image measures 1024 x 1024 pixels. It was captured from a distance of 9.8 km from the centre of the comet (8.8 km from the surface) at 22:18 GMT on 23 October 2014. At this distance, the image resolution is 83.5 cm/pixel and the size of the image is 855 x 855 m.
This view highlights the distinctive flat feature set atop a raised plateau on the larger lobe of Comet 67P/Churyumov–Gerasimenko. In several locations close to the base of this feature, there are patches of brighter material, perhaps recently exposed by erosion. This single-frame NAVCAM image measures 1024 x 1024 pixels. 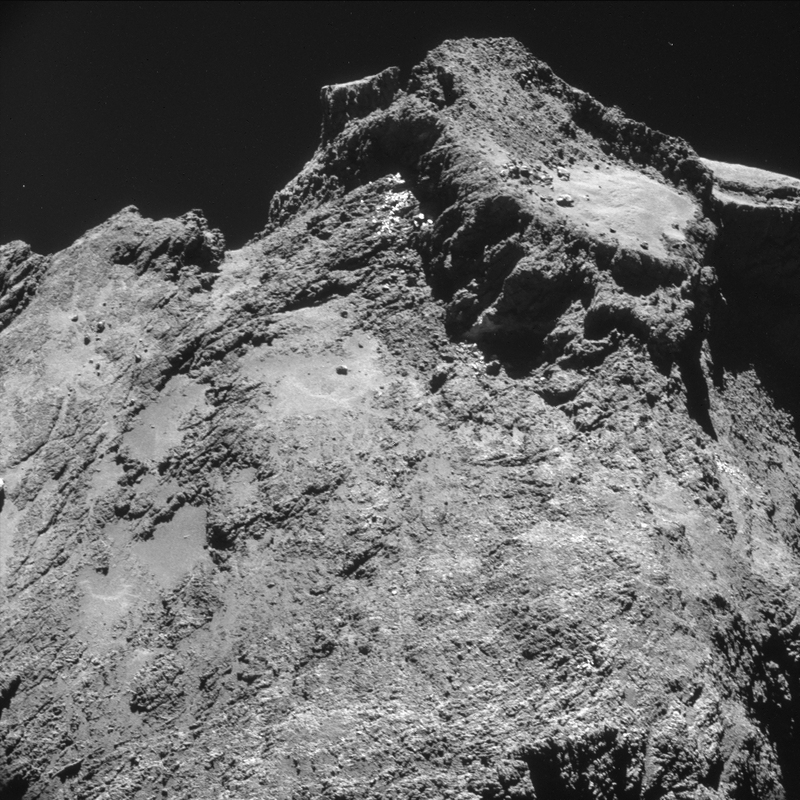 It was captured from a distance of 9.8 km from the centre of the comet (7.8 km from the surface) at 11:48 GMT on 24 October 2014. 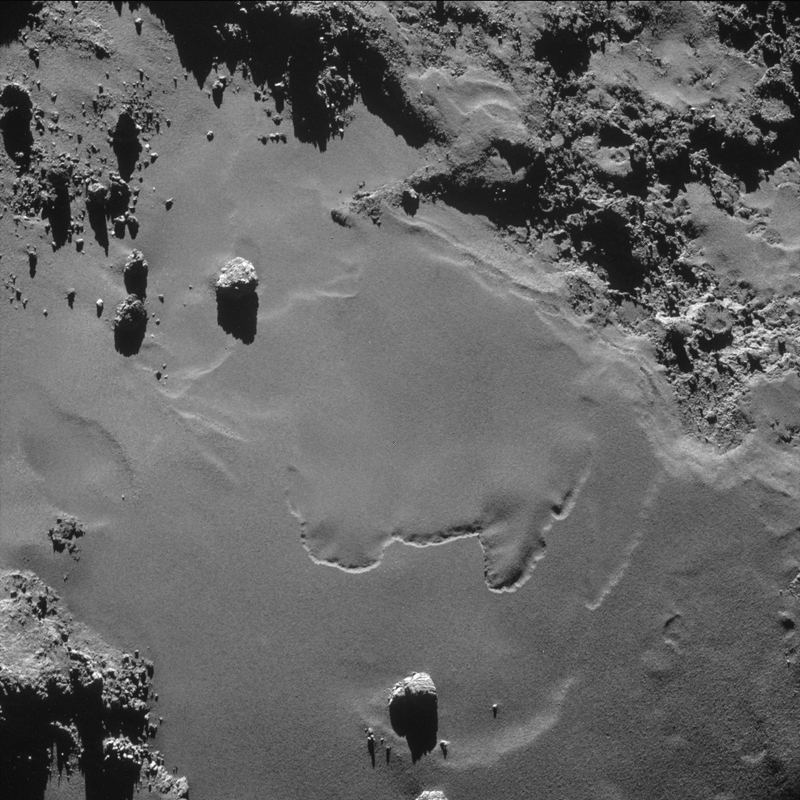 At this distance, the image resolution is 83.3 cm/pixel and the size of the image is 854 x 854 m.
This scene presents a dramatic view across the body of the large lobe of Comet 67P/Churyumov–Gerasimenko. Along the horizon a relatively broad, raised portion of material appears to be abruptly truncated in the top left. Zooming into either side of the inner portion of the wall suggests the presence of slightly brighter material – perhaps more recently exposed than other sections.. Although cast in shadow, the sides of the raised section shows signs of clear layering, along with fractures cross-cutting in many orientations. In the foreground, several large angular blocks are seen, some with faces that appear brighter than the surrounding material. In the background, a faint stream of gas and dust can be seen, showing that an active region is nearby. This single-frame NAVCAM image measures 1024 x 1024 pixels. It was captured from a distance of 9.8 km from the centre of the comet (about 7.8 km from the surface) at 18:08 GMT on 26 October 2014. 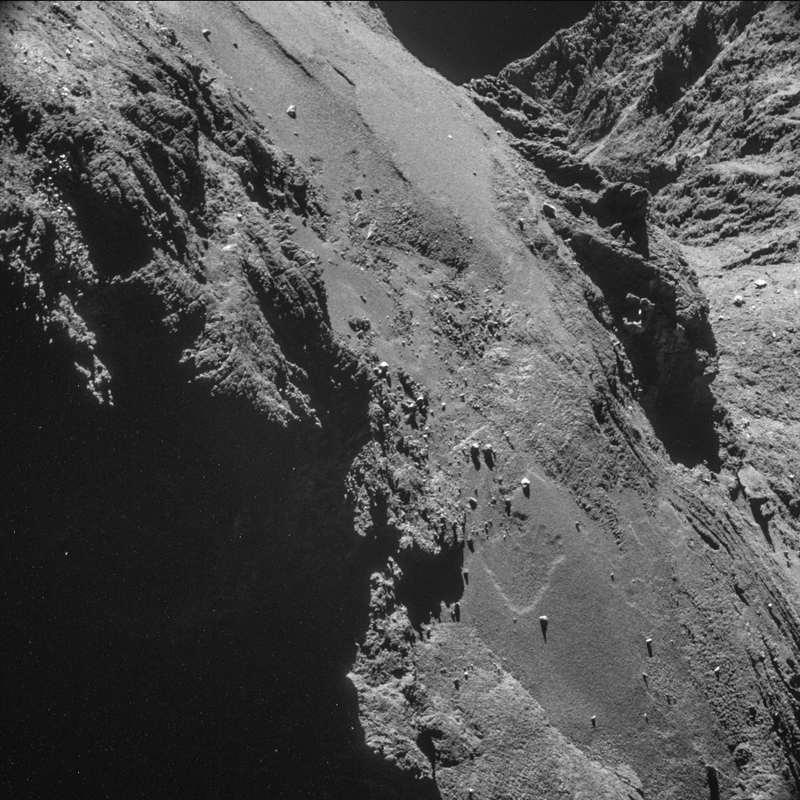 At this distance, the image resolution is 83.7 cm/pixel and the size of the image is 857 x 857 m.
Boulders seem to defy gravity in this view, apparently clinging to the steep sides of the larger lobe of Comet 67P/Churyumov–Gerasimenko, although of course it is all a matter of the orientation of the image and the local gravity vector. But perhaps the most intriguing feature in this frame is on the right-hand side, where thin layers of rock have the appearance of being flexed or compressed. 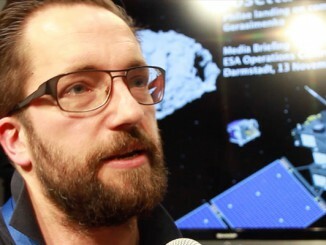 This feature sits close to the ‘neck’ of the comet, which can be seen in the background rising up towards the smaller of the comet’s two lobes. One theory for the comet’s formation is that two smaller bodies collided to create the comet shape we see today. Whether this layered feature is due to such a scenario or a completely different process remains to be seen. 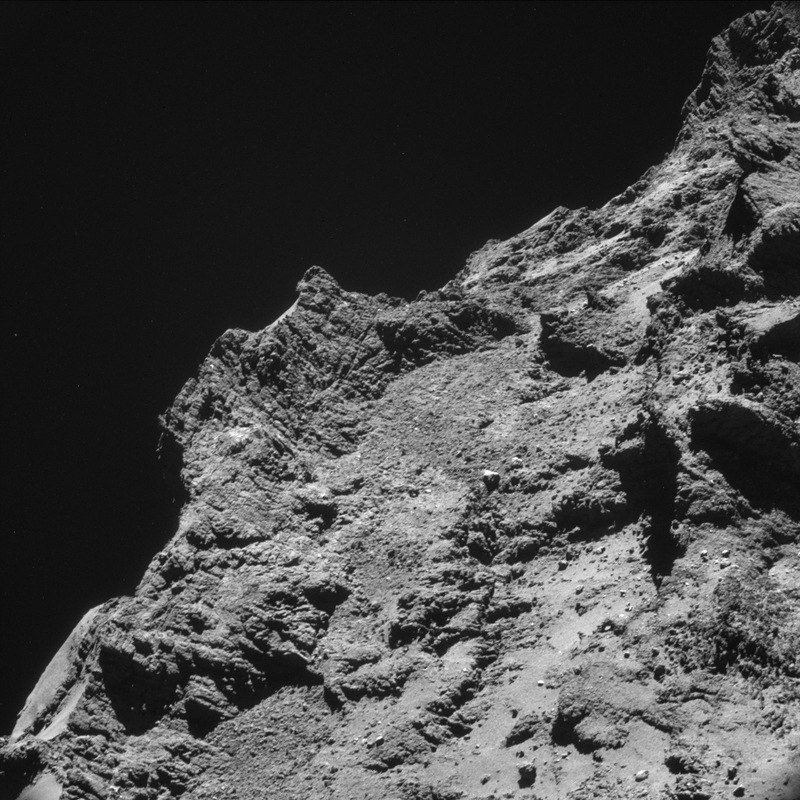 This single-frame NAVCAM image measures 1024 x 1024 pixels. It was captured from a distance of 9.82 km from the centre of the comet (about 7.8 km from the surface) at 18:22 GMT on 26 October 2014. 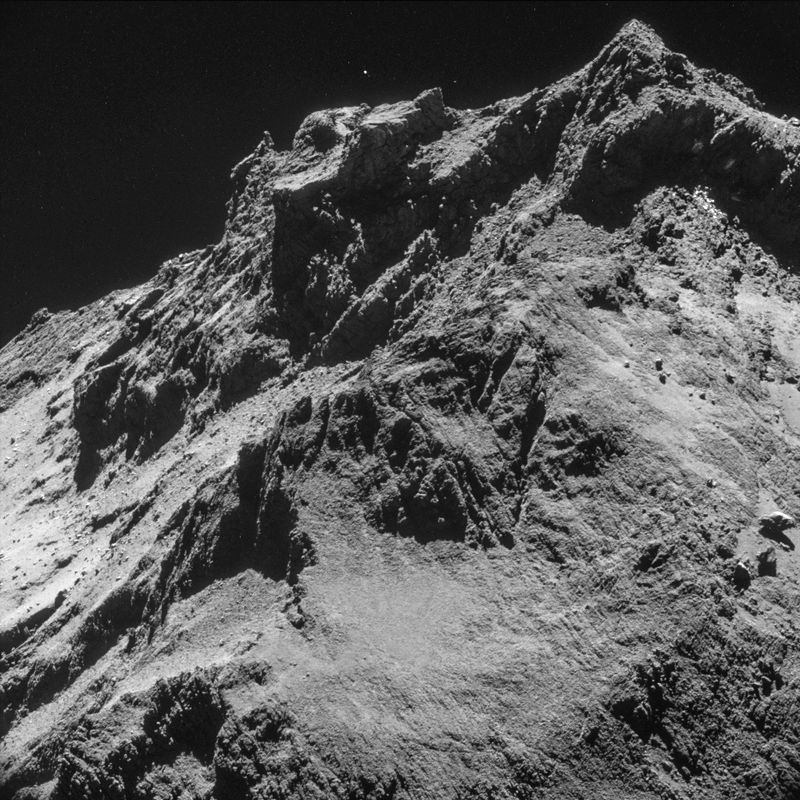 At this distance, the image resolution is 83.7 cm/pixel and the size of the image is 857 x 857 m.
This view focuses on the boulder-strewn neck region of Comet 67P/Churyumov–Gerasimenko, with the smaller lobe on the left and the larger lobe on the right. Much of the comet’s activity originates from the neck. The scene also shows the contrast between the rugged material in the cliff walls rising up to the smaller lobe and the soft, more ‘textured’ material that characterises the neck and that is also coating the larger lobe in this region. This single-frame NAVCAM image measures 1024 x 1024 pixels. It was captured from a distance of 9.7 km from the centre of the comet (about 7.7 km from the surface) at 06:22 GMT on 28 October 2014. At this distance, the image resolution is 82.4 cm/pixel and the size of the image is 844 x 844 m.